It is not enough that we come together and share our experiences and knowledge freely. All Cardiac Athletes have made a pledge as individuals and as a global team, to do all they can to eradicate heart disease from planet Earth once and for all! Zero tolerance. No excuses. Too many babies, too many young athletes, too many loved ones have been lost. Being selfish and ‘going it alone’ is not who we are. Together we are a stronger force. We educate. We are role models. 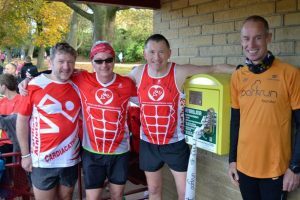 We raise monies and make sure that your generous donatio ns pay for baby heart monitors, AED defibs for sports clubs & heart screening of young athletes. All our CA Ambassadors are BLS / CPR trained. That way they lead by example. It’s no good talking about the need for more AED’s and CPR training in the community if we can not do it ourselves. Yes, this is one of the key roles of the CA Ambassador. To push for more safety and security within local communities. Remember a heart in deadly ventricular fibrillation needs defibrillating in less than 3-5 minutes if a live friend or loved one is what you want. 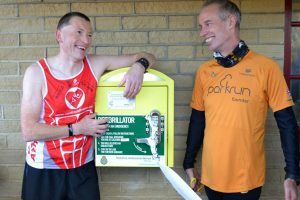 Cardiac Athletes has forged close and friendly links with “Park Run” all around the world, sometimes providing Park Run with AED defibs. It is a misconception to think that our Cardiac Athletes are a “high risk” running amongst you all. In actual fact Cardiac Athletes are a LOWER risk than you ! How come ? Well, because all CA’s have been thoroughly heart tested by top Cardiologists and had their heart conditions fixed, but you do not know the health state of your heart. Have you had a maximal ECG stress test performed by a Cardiologist ? No ? Then why are you pushing yourself in a Park Run ? Are you mad ? The beauty of having Cardiac Athletes running with your group is that many are fully BLS / CPR resus trained and certified so that if you did drop down dead they could be there to save your life.